Undercover Black Man: My dentist is hipper than your dentist. You should check out Asa available on Itunes. Its reggae, soul with an African specifically Nigerian angle. Hmmm... I had heard about Jill Rock-Jones, but for some reason I thought they were talking about Jill Jones who worked with Prince. I'm feeling her sound, though... Kinda reminds me of Joi from her Amoeba Cleansing Syndrome period. She's damn easy on the eyes, too... Can't be mad at that! 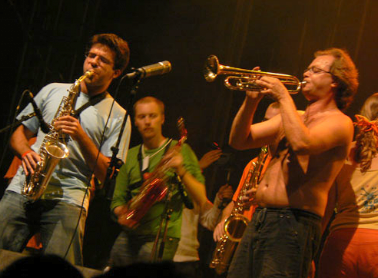 Terace Boulba is the 50 plus member farm team for all the funky brass bands in France. And yes, they love them some go-go records. My dentsit is a music fan also, he has yet to hip me to anything, but he cuts a great deal to members of the Musician's Clinic. And you were right, voyage2atlantis. Hilarious! I'll post it later today. Thanks. And yes, they love them some go-go records. Hey there, Davis. I find it endlessly cool -- and yet natural -- that funky Europeans would fuse go-go, Afro-beat and New Orleans brass band music into a single repertoire. Love Jill. If I'd have known about her when I still lived in Atlanta, I'd have been at every show. Did I quick google search & don't see where I can buy that song or where she's playing. Any ideas? ^ Wish I had more good information for you, Jeffrey. But the CD "Starring Jill Rock-Jones" is very hard to find. As for seeing her live... she's now based in Las Vegas. A few months ago, she was performing in a revue called "Songs of Praise."